Since its founding 50 years ago, the Beaux Arts Trio has become the gold standard for trios throughout the world. The Beaux Arts is in a class by itself. Beaux Arts approaches the mystical. The 2007-2008 season for the Beaux Arts Trio was nothing short of bitter-sweet: it marked the end of one of the most celebrated and revered chamber music careers of all time. After a stunning 53 years of consistent touring and performing which began on July 13th, 1955 at the Berkshire Music Festival–known today as the Tanglewood Music Festival–the members of the Beaux Arts Trio have taken their final bows on the concert stage. Described by many critics as being the end of an “era”, the Beaux Arts Trio has undoubtedly set the standard for performance of piano trio literature for all future generations. 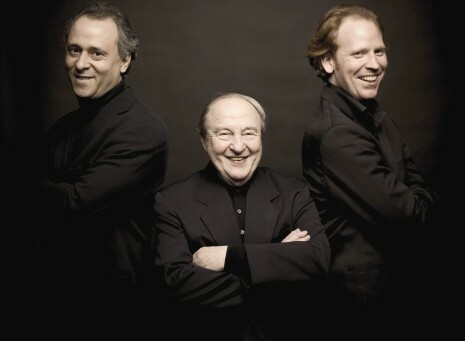 Pianist and founding member Menahem Pressler, along with all of his Trio colleagues, violinist Daniel Hope and cellist, Antonio Meneses, ignited overwhelming enthusiasm from audiences around the world. From the United States to Russia, from Japan to Germany, from Israel to Brazil, this renowned ensemble’s extensive engagements have brought it the highest praise and ovations from all of the world’s major music centers including New York, Boston, Chicago, Washington D.C., London, Paris, Berlin, Munich, Vienna, Amsterdam, Moscow, Tel Aviv, Tokyo, Hong Kong and Sydney. Chosen as Musical America’s Ensemble of the Year in 1997, the Trio has been invited and re-invited by these centers for over 100 concerts and master classes each year. The Beaux Arts Trio’s superb musicians, distinguished history, comprehensive repertoire and expansive discography, contribute to its reputation as a hallmark of chamber music. Through the years, the Beaux Arts Trio has maintained its freshness, while preserving its distinctive musical heritage. Founded by Menahem Pressler, Daniel Guilet, and Bernard Greenhouse, the Trio has evolved from the replacement of Guilet in 1969 with violinist Isidore Cohen, and the replacement of Greenhouse with cellist Peter Wiley in 1987. In June 1992, the Trio made its debut with violinist Ida Kavafian in two extraordinary performances of Beethoven’s Triple Concerto with the Gewandhaus Orchestra of Leipzig under Maestro Kurt Masur. Menahem Pressler created yet another legendary collaboration when he named violinist Young Uck Kim and cellist Antonio Meneses as new members in 1998. In their three seasons together, Pressler, Kim and Meneses earned highest praise from critics and audiences alike. British violinist Daniel Hope was announced as the Trio’s newest member in April, 2002, after highly successful 2002 winter tours of Europe and the United States. The Beaux Arts Trio’s mark in American culture is far-reaching. The ensemble has played a major and ongoing role in the programs of important cultural and educational centers throughout North America, with annual concert series at such revered institutions as the Metropolitan Museum of Art in New York, the Celebrity Series of Boston and the Library of Congress, where the Trio was in residence. Its repeated annual engagements extended to numerous associations and chamber music series, including those of San Francisco, Vancouver, Denver, Portland, Kansas City, Louisville, Saint Paul, Detroit, Philadelphia, Toronto, Cambridge and New York. The Trio’s engagements at major North American music festivals included Mostly Mozart, Caramoor, Ravinia, Tanglewood, Ottawa and Orford. The Trio’s regular University performances included appearances at Harvard, Princeton, Yale, Johns Hopkins, Berkley, the University of Illinois at Champaign-Urbana and the University of Michigan in Ann Arbor. The Trio’s annual international engagements included appearances at the festivals of Edinburgh, Lucerne, Vienna, Helsinki, Warsaw, Hong Kong and Israel, as well as performances in the chamber music series of the world’s major foreign cities. The Beaux Arts Trio’s many landmark projects included its participation in the “December Evenings” Festival in Moscow, at the invitation of Maestro Sviatoslav Richter, and a performance at the 1988 Summer Olympics in Seoul, South Korea. Several contemporary composers have written pieces for the Trio. Among the Trio’s recent premieres are Ned Rorem’s Spring Music, commissioned by Carnegie Hall as part of Carnegie’s Centennial Celebration; George Rochberg’s Summer, 1990, commissioned by the Philadelphia Chamber Music Society; and David N. Baker’s Roots II, commissioned by the McKim Foundation. The Beaux Arts Trio’s extensive discography on Philips Records encompasses the entire piano trio literature. The Trio’s recordings have brought several coveted awards, including the Prix Mondial du Disque, three Grand Prix du Disques, the Union de la Presse Musicale Belge Caecilia Award, the Gramophone Record of the Year, and the Stereo Review Record of the Year Award. The Beaux Arts Trio’s recording of music by Spanish composers was nominated for a Grammy in 1998. In September 2004, the current Trio released its first recording on Warner Classics (including works by Mendelssohn and Dvorak’s Dumky Trio) and Universal Classics released a 2 CD anniversary compilation from the Philips discography, also in Fall of 2004.